I had an Insulin Tolerance Test (ITT) or rather an Insulin Stress Test today. As the test is quite intense on the heart, I had an ECG yesterday which was fine. 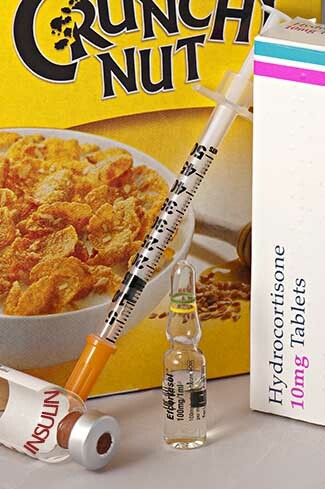 Insulin takes your blood sugar down, Crunchy Nut Cornflakes brings it back up again. Since my transsphenoidal surgery for acromegaly I have been kept on Hydrocortisone just in case my little pituitary gland has been damaged at all. One of the hormones that could be damaged is ACTH, which in turn causes Cortisol to be produced by the adrenal glands. Without cortisol, we die. Sobering stuff. Gulp. Anyhow, the test today is to determine if my pituitary is behaving properly by measuring my body’s production of cortisol to the ‘stress’ of very low blood sugar. An injection of Insulin drives down the blood sugar within around twenty minutes. The body normally keeps the blood sugar at around 5 mmol/L by producing Insulin or Glucagon depending on whether the level needs to go up or down. The only energy source that the brain can use is glucose as blood sugar. A sustained loss of blood sugar would result in the brain losing its energy supply which would result in a visit to the undertaker. Anyhow, during the test they don’t want the inconvenience of killing you off so the test is very tightly controlled and you are kept under a very close watch and are not left on your own. As the blood sugar drops to say below 3.7 nmol/L , the normal hormone responses are the production of glucagon, epinephrine, growth hormone. The Glucagon production results in the body trying to recover the blood sugar (the liver gets working hard). At a blood sugar of less than (say) 3.2 nmol/L, ACTH is produced in the pituitary gland, which in turn causes the adrenal glands to produce Cortisol. This starts a cascade of actions as a stress response – heart racing. Bingo – this is what they are measuring for. As my blood sugar went down I just felt as if I’d had a drink. I did mention it “on the way down” with comments like “that feels like two pints”, and then it was “wow that feels like five pints”. At that stage, I was feeling quite merry, lots of sweat pouring off my face, and a hunger like a student on ‘pizza night’. The nurse struggled taking blood from me at that point, and I had to make a fist in my arm to coax out a sample. My body was acting completely normally of course, it was constricting all the blood vessels in my extremities to conserve blood to my brain. It was certainly doing that. As soon as that magic blood sugar level was reached, I was given a bowl of Crunchy Nut cornflakes, with lashings of milk and an incredibly sweet cup of coffee. I managed to wolf down three bowls of the lovely crunchy stuff, along with the sugary coffee. I normally don’t take sugar in my coffee, but I really wanted my sugar. I found the whole experience absolutely fascinating, especially as everything was explained to me. I found the actual effects on my body quite astounding, I never realised how incredibly well controlled our bodies are by these hormones and steroids that float around our bloodstream. My blood sugar carried going down, and then recovered over the next hour or so. Later, I had some lunch while I was there and then once they were happy I was fine I was sent on my way. I was told that I could feel very weak in the next few hours, so it was best to eat something again quite soon. I went home by bus and tram (best not to drive). What a fascinating day! EDITED: I had the results that my cortisol production was completely normal, so I could reduce and stop my Hydrocortisone tablets as a result. Whoohoo!